Do you know how to use natural ways to Get Rid of Chubby Cheeks and Lose Facial Fat? Many of you may envy Angelina Jolie for her perfectly sculpted cheekbones or Johnny Depp for his sharply defined jaw line. This is not to say that fuller faces are undesirable. Many people love the look of a fuller face that is healthy and has a natural glow to it. However, there is a difference between a healthy, plump face and one that is storing excess fat. When it is the latter, you need to buckle down and address the situation. If you are generally overweight and concerned about the weight on your face, you need to start working out. Your facial fat may disappear with the rest of your body fat. However, it might not be as simple for everyone. Many of you may find that no matter how hard you try, you are unable to lose the fat on your face, especially the fat that settles in your cheeks and gives you a bloated appearance. Some people are just predisposed to accumulating facial fat. Many times, it is just in your genes, and many times, your biological makeup just chooses certain areas of your body and decides these target areas would cling to fat most dearly. Well, it’s hard luck, but not all hope is lost. You can still take steps to tone your face and give it the shape you desire. 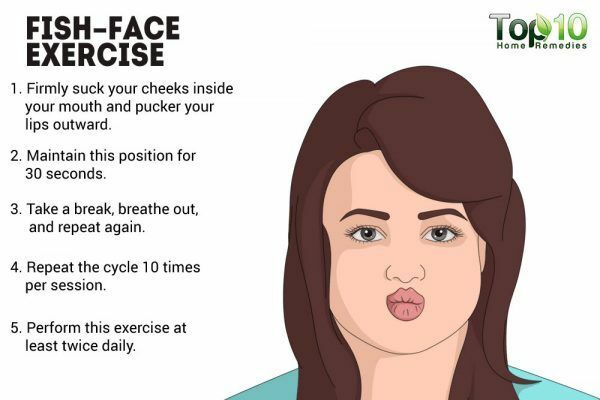 Here are some exercises you can perform to get rid of chubby cheeks and lose facial fat fast. Article in Beauty. Both comments and pings are currently closed.